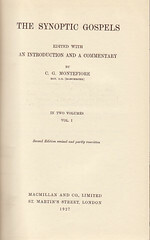 Publisher: London, England (U. K.): Macmillan and Co. Contents: BH Tehillim: 121 chapters (of 150) translated. 8 pages of Introductory Remarks. 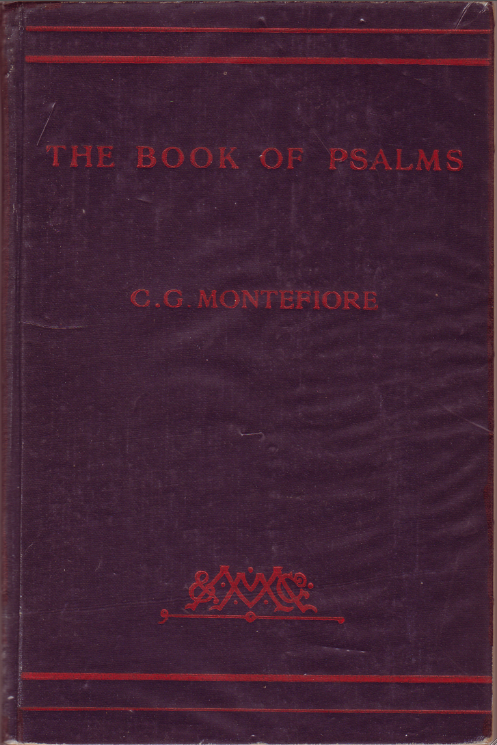 Psalms sorted by topics rather than the common numbering. 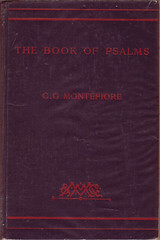 Every Psalm is explained and reflected. Comments: Crown octavo, hardbound 243 pp. 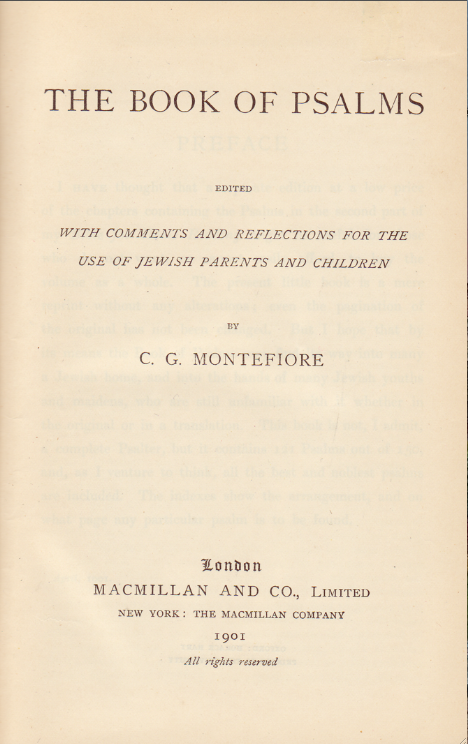 This is a separate- print taken from Montefiore's »The Bible for Home Reading«, London 1899. 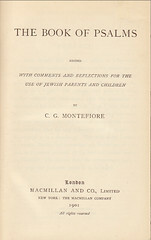 As Montefiore was a forerunner to Jewish- Christians relations, Christian thinking and even wording is incorporated in his comments. 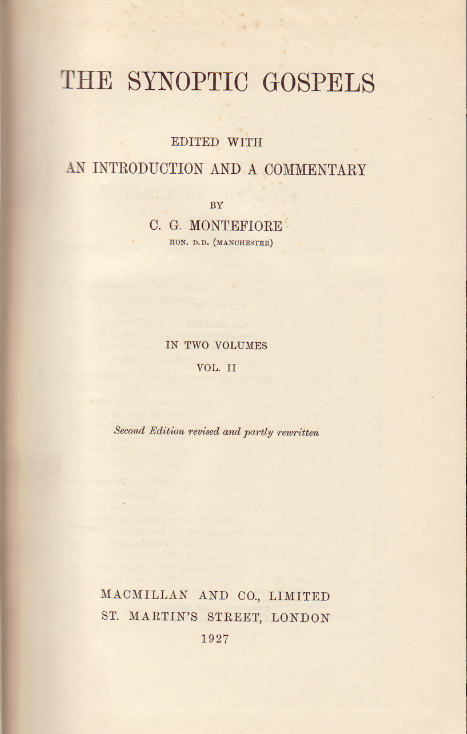 For example, Montefiore gives several other older translations in addition to his 23rd Psalm: that of the "clumsy" Vulgate, of Wycliffe (revised by Purvey c. 1388), that of the Great Bible (1539), the Geneva Bible (1560), the Bishops' Bible (1568), the A.V. (1611) and a metrical Scottish version 'still used beyond the Tweed'. Contents: Translation & commentary of »The Gospel according to Mark«, preceded by an 127 pp introduction. Comments: Hardbound, large octavo, 411 pp. Translation and exhaustive Commentary from a Jewish vantage point. 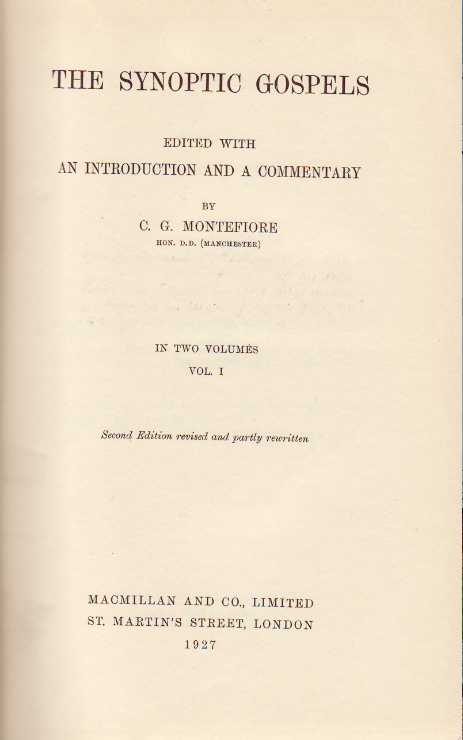 Underlying translation is that of the Revised Version (1881), with alterations, indicated. Comments: Hardbound, large octavo, 680 pp. Translation and exhaustive Commentary from a Jewish vantage point. 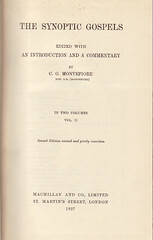 Underlying translation is that of the Revised Version (1881), with alterations, indicated. The Essay by Israel Abrahams titled »'Am ha-' Areç« (=people of the countryside) in the sense of "the crowd that knows not the law" (called by the Pharisees in John 7:49) discusses all the aspects of this subject.